PT Pertani (Persero) - Pertani is a well-established state-owned company in Indonesia that is involved in agriculture industry. Based in Jakarta, Pertani has core business competencies in production and distribution of fertilizers, rice, seeds, non fertilizer agricultural inputs (pesticides, herbicides, inoculum), services (land management, transport), warehouse management, commercial crops and horticulture. PT Pertani (Persero) was first established in 1956 and initially registered as Badan Perusahaan Produksi Bahan Makananan dan Pembukaan Tanah (BM PT). In 1960, BM PT renamed into Badan Pimpinan Umum Pertanian Negara (BPU Pertani) and then transformed into Perusahaan Pertanian Negara (PN Pertani). The name of PT Pertani (Persero) officially launched in 1984. 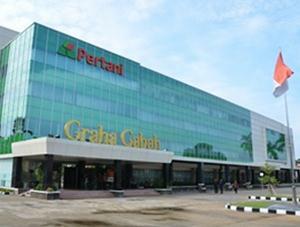 Pertani now has 7 marketing area offices, 2 strategic business units, 40 branch offices spread and 60 production units spread across Indonesia. In 2014, Pertani improved its performance, which was from a loss of Rp 278.23 billion in 2013 to a loss of Rp 179.36 billion in 2014. Pertani booked total net sales of Rp 1,043.61 billion in 2014. This number is down 26.34% from Rp 1,416.86 billion in 2013. This figures was stated by PT Pertani (Persero) in its latest financial statements (2014) as cited by JobsCDC.com. Minimum GPA of 3.00 within 4.00 scales. Graduated from a leading university/college accredited "A" (PTN/PTS). Fresh graduate (age : S1 ≤ 25 years old and D3 ≤ 23 years old). Physically and mentally healthy (indicated by Doctor's Certificate). Do not have a tattoo. Have driving license class C (SIM C) and or class A (SIM A). Actively involved in organization activities (formal/non formal) is preferred. Fluent in English is preferred. JobsCDC.com now available on android device. Download now on Google Play here. Please be aware of recruitment fraud. The entire stage of this selection process is free of charge. PT Pertani (Persero) - D3, S1 Fresh Graduate Program Pertani September 2017 will never ask for fees or upfront payments for any purposes during the recruitment process such as transportation and accommodation.